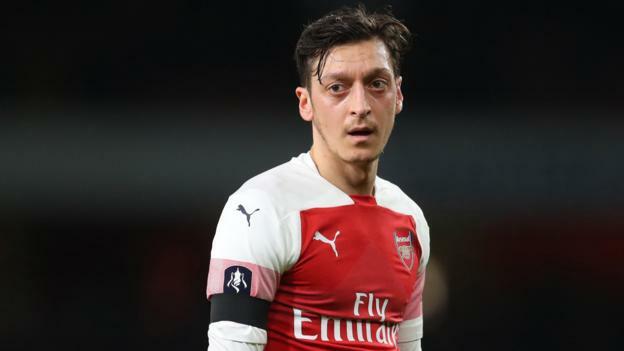 Arsenal midfielders Mesut Ozil and Aaron Ramsey have not been included in the squad to face BATE Borisov in their Europa League last 32 tie on Thursday. Ozil has returned to full training after recovering from illness but has not travelled to Belarus for the match. Ramsey, who on Monday signed a £400k a week deal to join Juventus in the summer, misses out with a knee injury. Pierre-Emerick Aubameyang and Granit Xhaka are back after missing Saturday’s Premier League win over Huddersfield. Centre-back Sokratis Papastathopoulos is still absent because of an ankle injury despite returning to training. “The players we didn’t bring in the squad were because Aaron Ramsey did not train with us and Sokratis only started training on Tuesday and Wednesday, and I don’t think it’s enough,” said Arsenal boss Unai Emery. BATE host Arsenal at 17:55 GMT on Thursday, with the return leg at Emirates Stadium on Thursday, 21 February. Petr Cech, who will continue to start in goal for the Gunners in cup competitions, said winning the Europa League would be the “ideal scenario” before he retires at the end of the season. “Winning the Europa League is a great memory for everyone involved and secondly it can book you a place in the Champions League,” he said. The Gunners take on a Belarusian side who have won the league title for the last 13 successive seasons. But BATE have not played since the group stages of the Europa League as their domestic campaign ended in December when they beat rivals Dinamo Minsk to the league title on goal difference. It’s only their third appearance in the knockout stages of the competition and they finished runners-up to Chelsea in Group L.
The last time these teams faced each other was in the group stages of last season’s Europa League and the Gunners thrashed BATE 6-0 at the Emirates, as well as winning 4-2 in Borisov. There will also be a familiar face in the Belarusian side. Former Arsenal defender Alexander Hleb, 37, spent three years at the club and made 130 appearances before joining Barcelona in 2008. “Arsenal are at the peak of readiness – for them this is a huge plus,” Hleb told Belarusian newspaper Pressball. “It will be hard for us. But we will try to squeeze the maximum out of the physical form that we have gained. “The usual preparation is under way. We held a training camp in Turkey and got into shape, as far as possible at the current stage. It is clear that we did not achieve ideal conditions in such a short time. BATE Borisov and Arsenal’s only previous encounter came last season in the Europa League group stages – the London side won both games, scoring 10 goals and conceding only two. BATE midfielder Igor Stasevich delivered more assists than any other player in this season’s Europa League group stages (six). The Belarusian side have lost all three of their previous home games against English clubs in European competition. They have never gone past the round of 32 in the Europa League, getting knocked out in 2010-11 by Paris SG and in 2012-13 by Fenerbahce. Arsenal were one of seven teams to remain unbeaten in this season’s Europa League group stages, alongside Chelsea, Dinamo Zagreb, Eintracht Frankfurt, Real Betis, Red Bull Salzburg and Villarreal. The Gunners have kept a clean sheet in each of their last five Europa League games, the longest current run in the competition.